Subjects in the Film & Video Collection at Mystic Seaport include sailing, square-rigged ships, storm scenes, boating, ocean passages, boat restoration, J Boats, yachting, various ports and cities, boat building, lighthouses, whaling, rowing, Gold Cup races, sail making, ice boating, oystering, fishing. The collection also has footage that shows Mystic Seaport as a location, including the Museum’s historic ships, watercraft and village. Two especially significant collections document the America’s Cup from the J Boat era through the 12 meter class, and the sailing exploits of Irving M. Johnson, including his 37-minute, black and white film, Around Cape Horn, and 7 circumnavigations of the globe (with his wife Electa) 1933-1958. 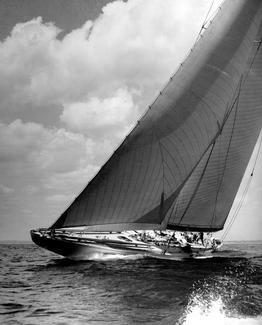 The collection spans the beauty of the J Boat era and the competitiveness of players from the 12 meter class as they race for the America’s Cup trophy. The J Boat footage was shot by amateur photographers from the 1920s and 1930s. Footage from the 12 meters was professional shot and through a generous donation by Thomas J. Lipton Inc. Mystic Seaport currently sells America’s Cup programs that span the years 1958 through 1983. Author, lecturer, and seaman, Irving Johnson and his wife Electa circumnavigated the globe seven times between 1933-1958, then dedicated 17 years to sailing the inland waterways, canals and seas of Europe and Egypt. The Johnsons documented each voyage extensively, often visiting remote islands and capturing images of traditions, customs, and lifeways that in many cases no longer exist. 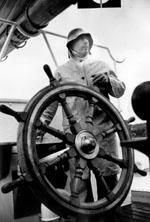 Mystic Seaport is the repository of Captain Irving Johnson’s films, which were donated to the Museum by Electa Johnson. 236 collections, 1.5+ million feet of film, 5000 videotapes, from 1899 through ongoing contemporary. VHS and some DVDs are for sale for home video use. Visit the Museum’s online store. Recent promotional videos produced at the Museum are available on YouTube. Our film and video collections are available for commercial and stock footage purposes. Fees are charged for research, licensing, and studio/lab uses and are based on the individual request. Email collections@mysticseaport.org for more information.